Mana selects a CD of Taro singing and playing shamisen to which she will dance. For four years now, Mana has been studying traditional Japanese dance with Taro, and she invited me, Mayumi and Tammy to come with her to Taro’s house for her lesson. Mayumi, who has studied traditional Japanese dance for many years, was particularly thrilled to have this opportunity, and we all instantly fell in love with Taro. Taro welcomed us warmly, and agreed to allow me to photograph her while she danced six dances for us. 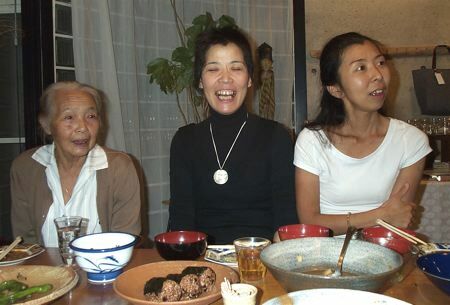 Mayumi said her dances reflected life on Ohshima; fisherman rowing, farmers planting and harvesting, the wind and the sea. She marveled at the perfection of every gesture in Taro’s dancing. Later Taro led us in Obon (ancestor worship festival) dance, and afterward would not let us leave without three large persimmons, a huge Asian pear, an offer of tea, and an offer of freshly caught fish. Mayumi and I declined everything but the fruit, but invited her to come to our performance that evening at the Oasis Cafe. Mana later told us Taro’s story. Taro was a widely respected geisha and the daughter and best student of a geisha famous throughout Japan for her dancing, singing and shamisen playing. 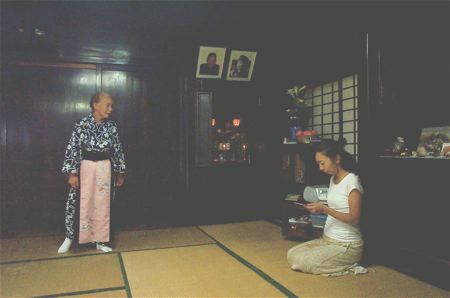 The house where she now lives was once the geisha house where she and other geisha lived. At 74, she represents the last generation of geisha in Japan. When she was young, she charmed the husbands of many women in Ohshima. Four years ago, after her danna (patron and lover), the greatest fisherman in Ohshima, died, in desperation she took a job picking up trash at the public parks. The women who still hated her would throw rocks at her while she was working. She became dirty and bedraggled, and contemplated ritual suicide (hara kiri) with a large knife. Then Mana came into her life. Mana, too, had been devastated by an unhappy marriage that ended suddenly, and she understood Taro’s pain. She persuaded Taro to teach her to dance, and at the same time, found other students and opportunities to share Taro’s tremendous cultural knowledge. She brought Taro to Hawaii to teach Obon dancing at the Buddhist temples. Taro was transformed by this journey and the love and appreciation showered upon her by her students. She got rid of the big knife and rededicated herself to her dance and music. Mana organized an art exhibition of Taro’s fabulous collection of handmade art treasure kimonos. 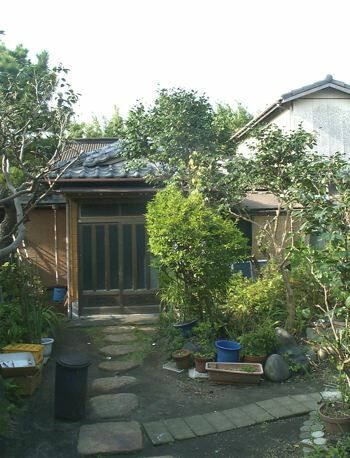 The former geisha house where Taro still lives, which survived a big neighborhood fire and is now the only traditional style house in her area of Ohshima. Taro, Mayumi and Mana at the Oasis Cafe dinner and concert. Taro brought the rare and very freshly caught reef fishes she had offered us, and Junko, the owner of the cafe, cooked them up crisp and tender for everyone to enjoy.